Sound & Light Shows (Son et Lumière) began in the Loire Valley, at Chambord, and provide a different perspective on château life. Many of the châteaux in the Loire Valley offer Sound and Light Shows (Son et Lumière) during the summer season. The shows vary from one château to the next, but all try to transport you to the time when the châteaux were the home of royalty. It's a fun way to thrust yourself into history. 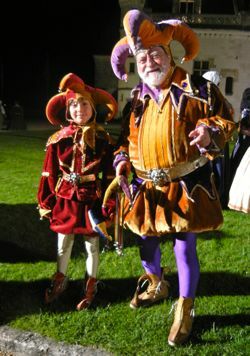 The Château d'Amboise has a charming Son et Lumière that is performed by over 400 volunteers from Amboise and the surrounding villages. It traces the château's history and focuses on the time of King François I, who ruled from 1515 to 1547. With a series of processions, dances, flaming torches, acrobatics, and horses, as well as music and creative lighting effects, the show presents a delightful picture of life at Amboise in the 1500s. 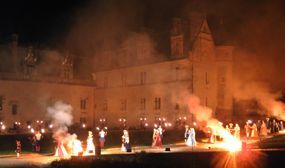 Leonardo da Vinci, who was living nearby at Clos Lucé at the invitation of François I, puts in an appearance, and the show culminates with brief fireworks. Spectators are seated in grandstands with an open view of the château and its grounds. Afterwards you can greet the cast. 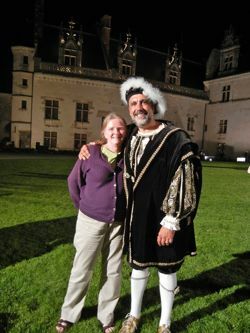 Jane even got to pose with King François I! Azay-le-Rideau takes a different approach, inviting visitors to stroll through the grounds around the château, while music seems to come from the trees. Projections on the château complete the picture. The grounds are open for about an hour, and visitors stay as long as they want and go at their own pace. Most Sound and Light Shows involve no performers, but rather project images and sound on the monuments, telling the history through pictures, music, and dialogue (usually in French). The first Sound and Light Show was presented at the Château de Chambord in the Loire Valley in 1952. The invention is credited to Paul Robert-Houdin, who was curator of Chambord, and who was also the grandson of Jean Eugène Robert-Houdin, famous magician and showman from Blois. Chambord still offers a delightful Sound and Light Show today. Sound and Light Shows are also presented at Chenonceau and Blois, as well as other châteaux in the region. Check with the local Tourist Office for show times, prices, and availability of performances in English or other languages. 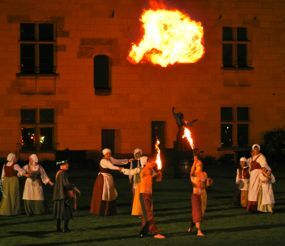 Fire Breathers, Château d'Amboise Sound & Light Show. And if you're traveling elsewhere in France, the Château de Versailles and other monuments also offer spectacular summer Sound and Light Shows. Sound & Light Show, Amboise.